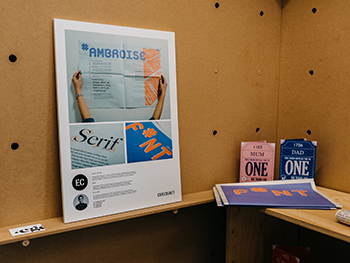 Final year BA (Hons) Graphic Communication student, Emily Caplan, has won herself a permanent job at McCann Birmingham after taking part in their unusual interview process at the Birmingham Design Festival. McCann, who were main sponsors of the four-day festival, had put out an advertisement for a job opportunity, and instead of CVs, they were asking applicants to pitch themselves for an unspecified role in 130 seconds, in the back of a van. Emily Caplan, who had signed up to be a volunteer at the festival, was planning on using the experience as a chance to network with people in the industry and open up potential job opportunities. I can honestly say that the Birmingham Design Festival has been the best weekend for my design career throughout my time at university. I only went and landed myself a job with McCann which is absolute madness! McCann were extremely impressed with the standard of Birmingham City University students and therefore, in addition to the permanent position offered to Emily, the advertising agency have offered paid work placements to an additional three Graphic Communication students. I wanted to say how impressed we were with all the BCU students. It was really difficult to shortlist and we’d like to get in touch with many of them to organise placements. I definitely did not expect to have been finished at university for just two weeks, and then land myself a job with the biggest advertising agency in the UK! It just goes to show that you never know what you can get out of events such as BDF, so it is always 100% worth getting involved. Emily is extremely excited to join the McCann team in their Solihull offices and start her creative career as a Junior Designer. Charlotte commented "the students were so competent, confident and inspiring. Congrats to all of them, I’m sure they’ll all go on to do very well."